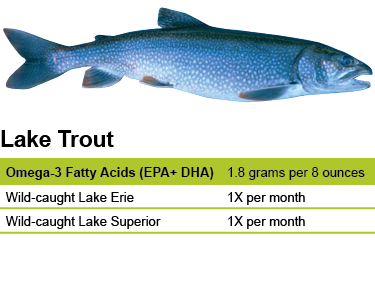 Lake trout have roughly the same amount of omega-3 fatty acids (EPA and DHA) as sockeye salmon. The flesh of lake trout is firm, rich in flavor and white to red (often orange) in color. It is oily and is often enjoyed smoked. Lake trout are harvested using gill nets, and most come from Lake Superior and Lake Erie. Lake trout is the only fish species subject to harvest limits in the Wisconsin waters of Lake Superior, where the total allowable catch is divided among tribal commercial fisheries, state-licensed commercial fisheries, tribal subsistence fishers and state recreational anglers. State and tribal biologists work together to monitor the lake trout population and adjust the allowable catch as needed. State health agencies have found that it is safe to eat Great Lakes lake trout once a month. Lake trout were historically the top Great Lakes predator. They generally live at or near the bottom of the lake, but some may also occur in the open water, far offshore. Because they are solitary fish that hunt alone, they are more difficult to catch commercially than whitefish and yellow perch. Lake trout may live as long as 20 years. It is the largest of all the trout; the average lake trout generally weighs 7-12 lbs., but the record fish taken from Wisconsin waters is a 47-lb. specimen caught in Lake Superior in 1946.